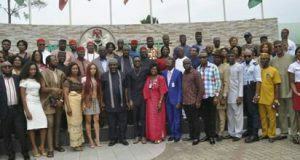 The Special Assistant to Imo State Governor Rochas Okorocha on Electronic Media, Dr. Ebere Nzeworji, has revealed� the actual amount used in building the controversial statues in the state. Dr. Ebere disclosed that the governor approved between N400,000 and N500, 000 for the building of each of the eight statues, contrary to the opinion of many of the public that N520 million was spent on each. He made this known on the Peoples’ Voice at Darlying FM in Owerri, as he said it was not true that millions were spent on erecting statue.